A three-sport standout who was a key member of the great football teams of the early 1950' s, Robert Davidson won 12 varsity letters in his four years at Concord High School. Born and raised on Sudbury Road, in the shadow of the old High School on Stow Street, Davidson grew up watching the powerful CHS football teams of the era at nearby Emerson Field. As a freshman, Davidson was a reserve halfback on the undefeated Patriot team that was selected to play in the prestigious Piedmont Bowl in Winston-Salem, North Carolina. Playing against powerful New Hanover HS of North Carolina and their star quarterback, Sonny Jurgensen, coach Bernie Megin's squad posted a 20-13 win to extend their unbeaten streak to 56 games. Davidson saw action in the game, registering a tackle on special teams. 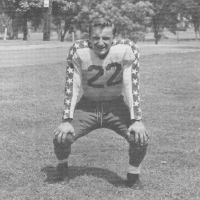 Davidson went on to letter three more years, earning most improved back honors as a sophomore and serving as co-captain of the 1954 squad. An Honorable Mention All-Scholastic as a senior, Davidson was also selected to play in the prestigious Lowell All-Star game in July, 1955. "Bob was the best football player I ever played with, and was pound-for-pound the toughest kid I ever saw," said David Bouchard, who was the only other freshman selected to make the trip to North Carolina for the Piedmont Bowl. "He was a terrific runner with incredible strength who was also a great blocker and force at linebacker on defense. Just as importantly, Bob was a wonderful person who had a great sense of humor." 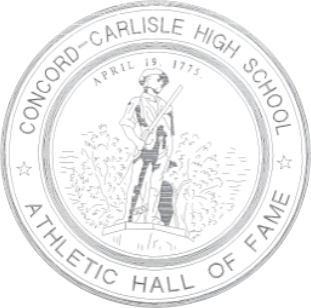 Winter found Davidson as a member of the Indoor Track team that practiced at the Concord Armory, competing in Hurdles, High Jump and Shot Putt. In the spring, Davidson took to the old cinder oval at Emerson Field, running relays as well as other field events for legendary coach Skip O'Connor. The President of the senior class, Davidson was named "Most Popular" by his classmates at graduation exercises in 1955. Following graduation, Davidson attended Suffolk University before returning to Concord to live and work. The owner and founder of Lincoln Painting Company and Davidson Realty Trust, Davidson served in the Concord National Guard and was a member of the Concord Elks, Knights of Columbus and Concord Junior Chamber ofCommerce. "Bob cherished his memories of playing sports at Concord High School and the camaraderie of life-long friends who were also teammates," said widow Cynthia Davidson Bouchard, his high school sweetheart. "He admired his coaches, Bernie Megin, Walter Carew, John O'Connell and Skip O'Connor, and always said that the lessons he learned while playing footba ll and competing in track, were the building blocks of his adult UJe. Bob would be so proud to join his teammates and classmates, Paul McLaughlin, Bill Hoyt, and Dave Bouchard, as members of the CHS Athletics Hall of Fame. I know he would be standing before you with a big smile on his face."